Acquired: TTM 2012, C/o Home. Jack Bicknell was quarterback for the Montclair St. Redhawks back in 1959. After establishing himself as a successful high school coach, he found himself at Boston College coaching runningbacks in 1968, – a position he’d hold through 1975. He’d take his first head coaching gig at Maine for the Black Bears, that next year, but return to be named head coach of Boston College in 1981. He’d really put BC on the map, and put his faith in a young quarterback by the name of Doug Flutie, who led them to a victory against the Miami Hurricanes with a last second hail mary, and won the Heisman in 1984. Before his arrival at BC, the school hadn’t appeared in a bowl game in some 40 years. Bicknell not only got them there, he got them to four over his tenure including the Tangerine Bowl, Cotton Bowl, Liberty Bowl, and the Hall of Fame Bowl. Over his coaching career at BC through 1990, Jack’s teams in those 4 bowl appearances went 2-2, and his overall mark was 59-55. A new football world beckoned in 1991 to Jack, and the WLAF came calling. 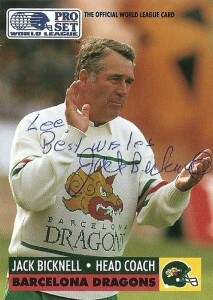 He’d be named head coach of the Barcelona Dragons franchise and was the face of the franchise for the next 11 seasons. 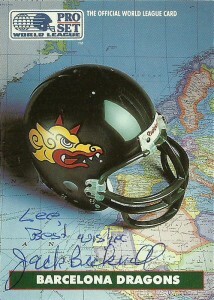 In the team’s inaugural season the Dragons finished an impressive 8-2, but eventually lost in the World Bowl to the Monarchs. 1992, the team won an overall weaker division, and was bounced from the playoffs. 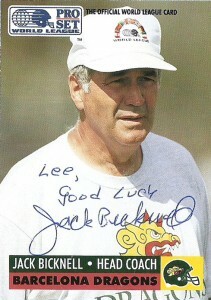 It wouldn’t be until 1997 that Cowboy Jack won his only World Bowl, 38-24 over the Rhein Fire. The team also returned to the big game in 1999, and 2001, but lost on both occasions. Bicknell coached the Dragons through 2003, when the franchise was shuttered, finishing with a 61-55 record. Jack also coached with the Scottish Claymores in 2004 to a 2-8 record, and then the Hamburg Sea Devils in both 2005 (5-5) and 2006 (3-6-1), before citing health reasons for retirement. Boston College in 2007 also named a Scholarship in his honor. He currently has a home in New Hampshire and Florida, and enjoys watching both of his sons coach at the NFL level. Jack was kind enough to sign 3 cards for me through the mail. I had checked sportscollectors.net and it appeared as though there was no success from him since 2007 so I went ahead and took a stab in the dark on this one that it might just still work.